This is a continuation of another post that covered my history with PTTD, my surgery and post surgical updates through the first 14 weeks. 3.5 months post surgery checkup: Uh oh. During my routine check up, we’ve discovered a complication. The screw going through the forward calcaneal osteotomy (for the lateral column lengthening) has broken and a gap has been observed between the allograft and the calcaneus. A CT was ordered to study the degree of healing for all locations affected by the surgery. CT report indicates that the first metatarsal fusion is complete and the posterior calcaneal osteotomy (medial slide location) appears fully healed. Unfortunately the forward osteotomy shows “no greater than 20% bone bridging” and as you can see in the inset image, there is a fairly significant gap present. Exact path for treatment is still to be determined by the my orthopedic surgeon, however due to timing, I am unable to get an appointment until approximately 4 months post surgery. When the damaged screw was discovered, I switched back to non-weightbearing (or very close to nonweight bearing) to minimize any further potential damage. 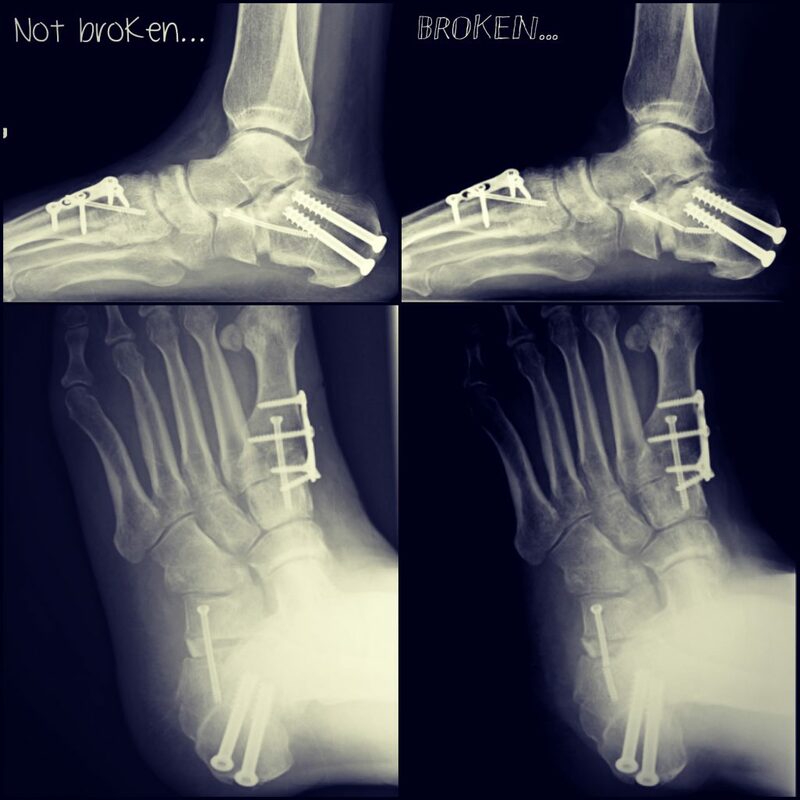 Some may wonder if I had any indication prior to the x-ray that something was wrong – I have a fairly high pain threshold and I have associated numbness in my foot due to the surgery and did not have any severe pain associated with the broken screw and failing bone graft. I have had some sensitivity near the lower incision site on the outside of my foot, presumably where they cut to make the osteotomies – the pain associated with this location was noticed while weight bearing (it felt like a bit of a prickling sensation on the outside edge of my foot near the surgical site), but more so during scar tissue release during physical therapy – I had been thinking it was more related to the sural nerve possibly being caught up in scar tissue. After having been off my foot for about a week as of this writing, I do notice some discomfort in that region even while not weight bearing. 4 months post surgery followup: Met for a followup with the surgeon to review my CT scan results – CT is showing minimal healing of the forward (Evans) osteotomy – basically the graft is not healing well to my calcaneus. I don’t have any significant pain when I try to walk on the foot, so I’ve been encouraged to continue with PT while wearing supportive shoes and at the same time I’ve been advised to really pay close attention to how my foot feels – so no pushing through pain. Things I’ve discovered since the CT: 1) I am low on Vitamin D and 2) possibly also low in blood calcium level. I’ve added a Vitamin D3 supplement (curiously, the Vitamin D3 can be derived from sheeps wool….and more specifically from lanolin from sheeps wool!) and have also added a calcium supplement (by way of Calcium Citrate powder – which, for me, is easier to deal with than trying to swallow a gigantic calcium pill). The surgeon has also ordered a bone growth stimulator to try to help with my bone nonunion situation. Apparently the presence of the non-union or the broken screw are not necessarily reasons to panic, or so says a 2nd surgeon who I went to see for a consult. The consulting surgeon agreed that my treatment plan is appropriate, and also encouraged me to walk on the foot while being cognizant of any pain or discomfort that could be related to the nonunion. 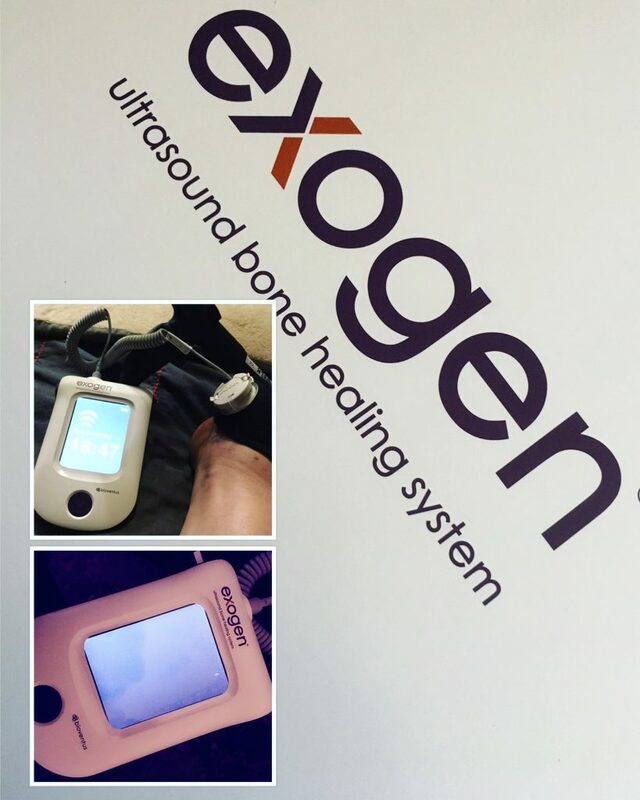 Obtaining the bone growth stimulator took a little while – there was an initial delay getting the order from the surgeon’s office to the DME supplier (presumably because it takes a while to compile the supporting notes to justify the order). Once the DME supplier had the order in hand, they had to submit it to my insurance to determine if it was covered or not. Presumably they got the approval, though I haven’t seen the EOB post just yet. It was shipped directly from the manufacturer to me. Use of the device is fairly straight forward, once I received clarification on where to place the transducer (which apparently has a beam approximately 5cm wide). 5 months post surgery: No significant differences observed in my X-ray, and I’m back to walking on the foot though my gait is still not quite right. I’ve been advised to wear supportive footwear at all times, though honestly, I feel that restriction is significantly hindering my ability to relearn a normal gait since a lot of my problems seem to stem from the fact that I don’t have control over the small muscles in my foot – the short distances I’ve walked barefoot (to go get the x-rays done, for example) highlight this in that my foot strike is completely screwed up, and my foot acts rather “blocky” for lack of a better way to put it. Transitioning weight through the foot does not seem to happen very naturally and I definitely cannot balance on my post surgical foot as the muscles are extremely weak and don’t seem to know how to respond as weight is transitioned to my fore-foot. For short distances I am okay walking without assistance, though further distances and prolonged standing still make my foot cranky. As far as PT goes, I’ve progressed to strength and balance training using bodyweight. The goal over the next month is to be able to walk consistently without needing to bring my crutch/cane around. 6 months post surgery: Bad news first – I had a followup CT to gauge the status of my slow-healing osteotomy and it seems like things are not progressing terribly well…I think the report states it quite clearly in that the “majority of bone graft remains unincorporated with no solid bridging across the osteotomy.” Reviewing the scan with the surgeon, it looks like the cadaver bone is being slowly absorbed by my body, but for whatever reason, my body is being rather stubborn about generating new bone tissue to incorporate the allograft, but I’m still hopeful that maybe it will change its mind with continued Vitamin D, Calcium and use of the bone growth stimulator. Unfortunately if things continue and my foot starts showing signs of collapse or misalignment, the only recourse seems to be another surgery. The happier news is that I seem to be relatively asymptomatic for having a potential nonunion. My gait has smoothed out a lot, though is not completely balanced and I continue have an occasional limp. Strength is slowly returning as I continue to work on that along with balance. In addition to doing some ankle stability exercises on the floor, I also have a balance disk (though I certainly cannot stand single footed on that without aid) and a balance board (I use this one with both feet on it – and always while standing near something that I can grab for support). I can do dual leg body-weight calf raises, but I don’t have enough strength to manage doing single legged raises (or to walk on my toes for that matter). Progress seems to be moving along again, and I’ve been cleared to start trying to get back to “normal” activities and footwear (or no footwear if that is my preference) to see if my foot and ankle will tolerate those things. I find my pains these days to not be consistently concentrated in any specific location – they seem to move around as my muscles are continuing to relearn just what all they should be doing. I’ve attempted to try some of my other shoes on now that my foot no longer seems to have excessive swelling – I’ve noticed that the metatarsal fusion has definitely changed my instep height, but thankfully it does not appear that my overall foot length has not changed – at least not enough for me to notice with the few pairs of shoes/boots I’ve tried on. I’m not sure if I will ever be able to get back into some shoes/boots – I’m hoping with time any additional swelling will leave and the scar and tendons on top of my foot will become less sensitive to pressure – otherwise I’m going to be mourning the loss of several pairs of lovely shoes and boots including my beloved red Doc Martens. Surprisingly, or perhaps not, my left foot displaced 88g or about 3 oz more water than the right. 3 oz is about the volume of a deck of cards, in case you are wondering. Activity wise, I can walk further now, and can handle relatively flat well maintained trails – but I can’t cover the kind of distances I could before the surgery without the foot complaining. My single leg balance is getting better, though is still rather wobbly – and I still cannot manage single leg calf raises or walking on my toes. 10 months post surgery: Toe walking achieved! Not for very long durations and not without shoes but still…progress! Single leg calf raises are still a nonstarter without being able to take some of my body weight off by pressing on a counter, but I’m making slow progress. In addition to the toe walking, I’ve managed to take a couple short hikes on much more challenging terrain. Often, my foot will swell later in the day or the day afterwards in protest, but as I gain strength in the muscles, I expect to be able to increase mileage and difficulty in terrain. I recently did another volume displacement check and my left foot is now within 17g or 0.6oz (just over 1 tablespoon) of my right foot. I did not think to check the volumes of my feet before I had surgery and I honestly can’t remember which foot has historically been the larger one. My calves are still noticeably different – while muscle tone is coming back, I am still lacking a significant amount of muscle mass in the left calf (it remains about an inch smaller in circumference than the right calf or my pre-surgery left-calf measurement). I remain asymptomatic for the nonunion as far as I can tell, though I’m starting to get weird sensations around my various incisions – I think the nerves are coming back and I’m regaining feeling where there was numbness before. I have a followup CT scheduled in another few weeks; in the meantime, I will continue trying to improve my balance and strength in my left foot/ankle. 11 months post surgery: Followup CT completed – and I’ve officially got myself a fibrous nonunion. The good news is I am relatively asymptomatic – I have some fleeting pain around my scars, and I still get muscle soreness and occasional flare ups of my plantar fascia and disperse prickliness for lack of any better way to describe it, but there is little localized pain related to the nonunion. On occasion I get pain at my subtalar talar and talar fibular joints but, nothing high enough to cause me concern. Where does the path go from here? Surgical consultations leave me with 2 options: The first is a revision surgery – where they would go back in and “redo” the evans osteotomy graft. They can graft it with autograft harvested from my iliac crest – or they can do an allograft again…or there are metal wedges (both porous and non) that could be inserted. For fixation, it could be via screws (similar to last time) or plate – though a plate can cause irritation of the peroneal tendons…downtime would include up to 3 months of non weight bearing in a cast or boot. And after all that, I could still be stuck with yet another nonunion. The second option is do nothing – and basically continue to monitor. It seems some of the weakness I have is to be expected, especially with my calf (which is still noticeably smaller when compared to my other leg) – the calf weakness is likely due to the gastroc release (which resulted in lengthening my calf muscle and therefore making it less effective). I’m a bit leery of hobbling about with a gap in my calcaneus, but I’ve been advised that orthopedic surgeons generally operate to try to reduce pain, and not just to address a perceived issue in a radiograph. My primary concern is that my heel will continue to move, since the calcaneus is no longer in one piece but if two independent surgeons warn you off a surgery, it’s best to take heed. I’ll be following up down the road with yet more x-rays to make sure nothing has moved significantly, while in the meantime I’ll probably need to make nice with the gym to try to regain muscle strength faster. I’ve been advised to go on with my life and pick up all my activities and see what limitations (if any) remain after I regain strength – apparently it is not completely abnormal to have an asymptomatic nonunion at the evans osteotomy site if it’s done correctly, so hooray for that. I had surgery 4 months ago, my tendons had ruptured but due to various errors on behalf of the NHS, I eventually had to go private after suffering 3 years of progressive pain. I was given a cortisone injection into the subtalar joint, from this the pain escalated through the roof. 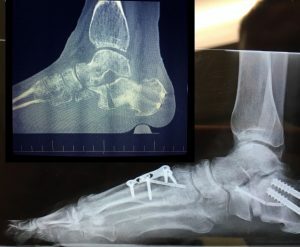 It does not appear that surgery has been successful or even done correctly, my surgeon recommended insoles, which I duly bought, but he then told me I would need to be fitted with orthotics on speaking with the therapist I was informed, that she was surprised as orthotics are not usual after this type of surgery. I am still in pain, albeit nit as severe, I have not recovered from the surgery, I am constantly weak and fatigued with dizziness and nausea..this has gone on since the surgery. It would appear my tendons were ruptured at the time of impact, which means I was 3 years struggling through the pain. My surgeon called me a remarkable woman, having worked through this. oh goodness. I’m so sorry to hear of your situation. Have you tried to find a surgeon for a 2nd opinion / revision surgery? I only had a block for the saphenous nerve – and I was out for the surgery. I did not do well with the anesthesia. At 4 months post surgery, I was transitioned past my walking boot to a soft ankle brace – I imagine for you you had to undergo a number of reconstructions if you ruptured more than one tendon. These things can take a while to heal – has your surgeon commented on your progress? Is it normal considering the amount of damage you were walking around with for years? If your surgeon cannot answer your questions, you might want to really consider finding another surgeon for a 2nd opinion. While I had complications, and I’m still regaining strength, I do not notice pain unless I push things too hard. I still have some inflammation, but I am able to get into most of my shoes from pre-surgery, and I have actually stopped wearing my orthotics. I am so sorry to hear about your experience, Kim. I hope you continue to improve – even after a year post surgery, I was definitely still not fully recovered, and I’d say that even now I have issues with some things. One thing I have learned is to not push it – it takes a while for things to calm back down if I overdo things and secondly I am not doing myself any favors by not staying on top of regular conditioning (which may not be the case for you). Basically my weekend warrior lifestyle doesn’t work so good with recovery from this invasive of a surgery. Any chance you can get a followup 2nd opinion? That’s what I did when dealing with my nonunion.